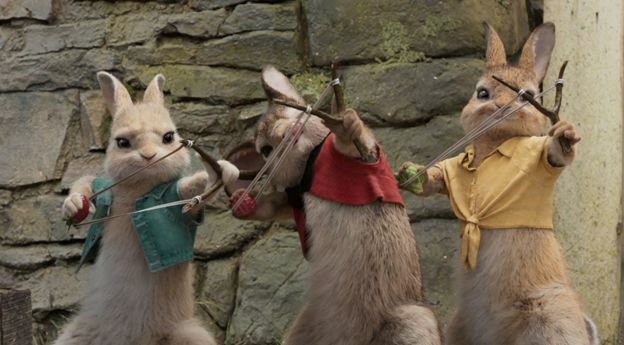 The CGI/live action adaptation of the popular story of Peter Rabbit, has recently been released in the USA and is due to be released in the UK next month. However, only a few days after its release, the film’s makers have been criticised over a certain scene in the film that “promotes bullying to children with food allergies”. The backlash has even caused calls for the film to be boycott completely. The scene in question involves Peter Rabbit and his friends throwing blackberries at another character, knowing that he is allergic to them. The character, Mr McGregor’s nephew Thomas, is forced to use an EpiPen as a result of the attack. Many are outraged with Sony Pictures for this scene, and have accused them of promoting this kind of bullying to young viewers. Plus, you know it’s serious when there’s been a trending hashtag (#boycottpeterrabit) making the rounds on Twitter. Let’s take a look at some Tweets. Charity group Kids With Food Allergies posted a warning about the scene through a Facebook post, and had also written a letter to the filmmakers. “It is unnecessary for a film to show the characters intentionally attacking another with his food allergen to trigger anaphylaxis.” the group wrote. “Portraying anaphylaxis as a joke can cause some people to have a cavalier attitude about food allergies which can put kids with food allergies at risk. Also writing a letter to the filmmakers was Kenneth Mendez, the CEO of the Asthma and Allergy Foundation of America. In his letter, he urged the studio to “examine your portrayal of bullying in your films geared toward a young audience”. The studio and filmmakers have apologised over the extreme insensitivity of the scene, stating they “should not have made light” of the issue and it was wrong for filmmakers to include the scene, “even in a cartoonish, slapstick way”. “We sincerely regret not being more aware and sensitive to this issue, and we truly apologise”. Despite this, the hashtags just keep on coming. There are some out there who just don’t understand what the fuss is all about, with one particular user referring to them as “#crybabies”. What are your views on this? Do you think the scene was too harsh and shouldn’t have made light on the seriousness of food allergies, or should people stop complaining and simply tell younger viewers not to copy what they see on the screens? Let us know your thoughts in the comments section down below.